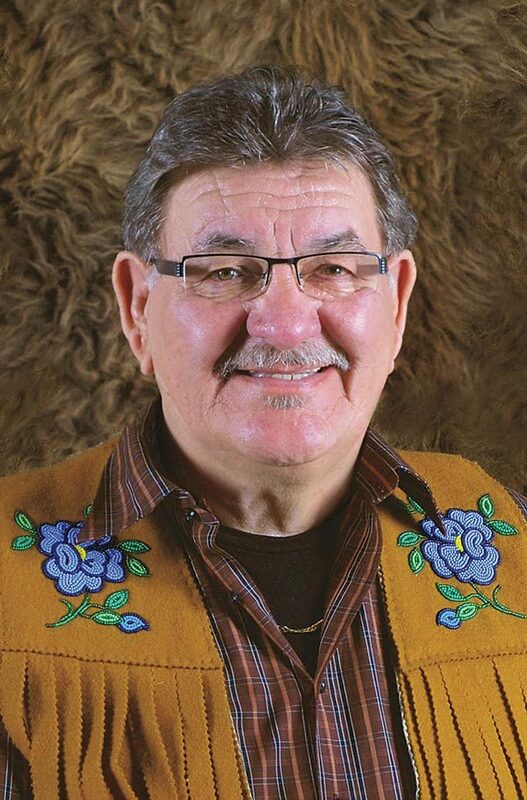 Norman Fleury is a leader of preserving the Michif language. The Métis are primarily known for speaking Michif, the official language of the Métis Nation. However, the Métis speak other languages, including French Michif, a dialect of Canadian French with some Algonquian linguistic features, which is spoken in St. Laurent, Man., St. Ambroise, Man., and St. Louis, Sask. ; Northern Michif, a Plains Cree dialect with extensive borrowing of French nouns, which is spoken in northwest Saskatchewan in and around Île-à-la-Crosse; nêhinawêwin (Swampy Cree or the “N” dialect), which is spoken by the Métis in Cumberland House, Sask., and in bordering areas of Manitoba; nêhiyawêwin (Plains Cree or “Y” dialect), which is spoken in southern Saskatchewan, Lac La Biche, Alta., and on the Alberta Métis Settlements; nakawēmowin (Saulteaux or Plains Ojibwa), which is spoken in the Interlake region of Manitoba in such places as Duck Bay; dënesųłiné (Chipewyan/Dene), which is spoken by Métis in La Loche, Sask., Fort Chipewyan, Alta., and throughout Northwest Territories. The Métis also spoke Bungi or Bungee, a Métis dialect of English that includes many Cree and Scots Gaelic words. It was spoken in Manitoba wherever Scots-Métis settled. Métis working in the fur trade also spoke Slavey Jargon (Slavey mixed with French and Cree) in what is now southern Yukon, and Chinook Jargon or Chinook Wawa (a trade language made up of Nootka, Chinook, French and English words) throughout the Pacific Northwest. In earlier generations, the Métis were probably the most multilingual people in Canada — they spoke their own languages as well as a variety of First Nations and settler languages. Today, the Métis may speak Michif as well as Cree, Saulteaux , Dene and various settler languages. Besides speaking several First Nations and European languages, the Métis also invented Michif, French Michif, Northern Michif and Bungi (a Cree/Scots-Gaelic Creole). All Métis heritage languages are endangered. Losing any of them would be tragic because that would mean losing a rich Oral Tradition, healing traditions, spiritual systems, communitarian values and harvesting strategies. While Michif is one of many hybrid languages throughout the world, linguists maintain that it is unique, demonstrating the Métis’ genius for fusing disparate cultures into a coherent synthesis. It is composed of the Plains Cree dialect (with some Saulteaux) verbs/verb phrases and French (with some English) nouns/noun phrases. Its origins date to the late 18th century. It is spelled phonetically and does not yet have a standardized orthography. Traditionally, many Elders called Michif “Cree,” while referring to themselves as “Michifs” or “métchifs” — a variation of “métif” or “mitif,” an archaic French spelling of Métis. French Michif, or Métis French — traditionally spoken by the Métis in St. Louis, Sask., St. Laurent, Man., St. Eustache, Man., and other communities in Western Canada — is considered by linguists to be a dialect of Canadian French. However, French Michif is not easily intelligible to francophones. It differs from standard Canadian French in numerous ways, including its lack of gender differentiation for personal pronouns, its occasional borrowing of Cree and Saulteaux syntax and its different French vocabulary, vowel pronunciation and possessive construction. French Michif is one of the ancestor languages of Michif, since both languages have nearly identical French components (which evolved from the French spoken by the French-Canadian voyageurs). Until recently, francophones stigmatized French Michif speakers for speaking “bad” French in communities such as St. Laurent, Man., and St. Eustache, Man. Consequently, the language was not handed down to succeeding generations. Like Michif, French Michif is spelled phonetically and does not have a standardized orthography. Northern Michif is spoken in northwest Saskatchewan, with most speakers living in or near Île-à-la-Crosse, Buffalo Narrows, Beauval and Green Lake. According to linguists, Northern Michif is a Woods Cree dialect (sometimes referred to as the Rock Cree) with some French (noun) word borrowings. This form of Michif is strongly supported by community members and is taught in schools, most notably Rossignol Elementary School in Île-à-la-Crosse. This language has a standardized (Cree) orthography, although its few French words may be spelled phonetically or in standardized French. Oral history indicates that Heritage Michif was spoken in northwest Saskatchewan but that it was replaced by Cree, Dene and Northern Michif. Unfortunately, colonization has had a devastating impact on the Métis’ collective identity, particularly through the near eradication of Métis heritage languages. For almost a century, the Métis bore the stigma of having Indigenous heritage, having mixed ancestry and of being labelled as “rebels.” This meant that many Métis downplayed or hid their heritage for cultural safety in order to better fit into the non-Indigenous mainstream. Moreover, non-Indigenous people often ridiculed the Métis for speaking Michif in the school system and in the community. This teasing led many Métis to become ashamed of their identity. Moving to cities also meant that most Métis lost their Michif language and culture. The end result was a loss of heritage language retention among at least three generations of Métis, which means that most Métis today (perhaps 90-95 per cent) are unable to have a simple conversation in any of their heritage languages. The vast majority of those who still speak Métis heritage languages regularly are elderly. As a result, English has become the working and living language of the Métis Nation, with French still used in some Métis communities. Today, passing on the Michif language to young people is a concern for many Métis. Michif speakers and Métis institutions such as the Gabriel Dumont Institute and the Louis Riel Institute are producing Michif language books, music and websites. The push to revive Michif and restore it as a functional language has also been undertaken by the Métis National Council and its governing members. Michif is the official language of the Métis Nation.